Intex still firmly dominates both the category of inflatable chairs for adults and pull-out sofas (especially for indoor use) and air pumps for the products. The outdoor lounges (pool floats and patio ottomans) are a different story and the competition is fierce. The Tear-Aid is still the best rated patch kit. Note: if you stumble upon this guide but you’re looking for a regular air mattress, you can see our top picks here – best air bed. SKIP TO THE PART you’re interested in. 6 Air mattress deflating and no hole? We rate the products in 5 quality categories: Comfort, Air retention, Durability, Pump and Value for money. The Intex Empire has been the top rated product in this category for 5 updates now (10 months). Rated at 91/100 it’s by far the best rated inflatable chair, with the runner-up (Intex Café Club) trailing by hefty 5 points. We’ll now move on to excerpts of the user experiences with the Intex Empire – what they liked or disliked about it. Exceeded our expectation – it’s big and comfy and the slouch is just right. I’m 190 lbs, and it holds me without losing air. I was in a dilemma between investing in one of those expensive soft lounge chairs and getting an inflatable one. I decided to be practical and try this “budget-solution” first before splurging for more expensive stuff. Boy was I right to give this bad girl a chance, it’s surprisingly sturdy and holds air for weeks without the need to top it off. Very satisfied with the purchase. Not a single person that came around our house after we got these left without commenting on these new babies on our porch. We got the ones in green, and they go great with the wood of the porch and the green of the patio. Such a bargain. I got an inflatable piece primarily because I needed something for our lake house…something cheap and easy to carry. We spent the week there this year, and we brought the loungers back with us because the kids loved them so much. It’s a good looking product, and I was excited when I got it, but it started leaking air within 3 months. I’m getting a new one hoping that I simply got a dud this time around. I didn’t know (nor does it say in the description) that you have to get the pump separately. My inflatable Intex chair in green arrived two days ago, and it looks fun but I had to order the pump, and I’m still waiting for that. A pretty important “detail” to miss out fro the product description. I’d really like if they had more colors to choose from. Our pool area is designed very classy, and these bright greens and purples just stand out too much. First of all, let us mention what we’ve seen when talking to people about the inflatable loungers. We don’t really know how to approach the subject without coming off as biased or cheeky but the way people judge products like this one is a bit distorted. Let’s thread carefully and explain what we’ve seen – when you decide to go with an inflatable chair, you accept the risk of air leaks on arrival. In other words, some of these will be duds. The real question is this – where is the “red line” where statistically acceptable error of torn seams and air leaks becomes a quality issue. We have been reviewing inflatable beds and other products for about a decade, and we found that there is such line – the ratio that we’ve taken as criteria based on our experience is 7:1. This means that if we see one user reporting air leaks for every 7 users who report the inflatable to work as expected (no leaks), we consider it acceptable. The Intex Empire is way above that line which means it is our opinion that there’s no true air retention issue with the product. With the rating of 92 for comfort and a stellar 94 in value for money, the Intex Empire is by far the best inflatable loungers for adults on the market and it’s a testament that Intex products are still well made – you can see the best Intex air mattresses here. This Intex inflatable chair is an industry classic and still holds its ground “against” new arrivals. It’s been the stick against which all new products of the type are measured. Rated at 88/100, this is the runner-up of the category and, more importantly, has been in the top 3 since we initially compiled the guide. It’s rated so high (95/100) in the category of value for money. Amazing value for money – it’s great for gaming and perfect fits in my dorm and makes for a great extra bed. This is much better and stronger than I expected. It holds air for weeks at a time without adding air and no rips or tears so far even with our 2 cats sleeping on it. Bigger and more comfortable than I expected and it still packs pretty small. We’ve been using it in our cottage and for sleepovers for two years now and no changes. I love the teal color, this inflatable looks and feels much better than you’d expect at that price point. Perfect for car camping – soft and comfy, stays inflated for days at a time. The material feels great – it’s not that plasticky stuff they usually use for inflatable chairs, it feels rubber-like and that makes all the difference. Very practical – easy to set up and down, no air leaks or any problems of the sort so far and the soft velvet-like finish is pretty easy to clean. It inflates fast enough but deflates a somewhat slower. It’s best to get an electric pump if you’re going to use it often because there are three separate parts to inflate – the two sides and the middle part. I can’t understand why the valve of the sitting cushion is different than the valves for the other parts. I only have one extension on the pump, and I have to inflate the middle part by mouth. I guess I’ll have to get a new one now, one with the few kinds of extensions. It sits pretty low so getting out of it isn’t easy. First things first – let’s clarify some things that we’ve seen confusing people about this Intex over the years. It’s a bit harder and more complicated to inflate and deflate than you’d think (certainly harder than other similar products). That’s the price of versatility – the fact that it doubles as a bed. There are 4 separate parts to inflate and deflate, so just be aware of that and get yourself a pump if you are considering getting it. If you plan to use it daily (inflating and deflating) it’s probably wise to get an electric pump. Material and smell – this Intex is somewhat different compared to other inflatable chairs. It’s not listed in the specs, and we couldn’t find confirmation of this, but the material doesn’t feel like plain PVC. Whatever the case, there’s no plastic smell that’s usually an issue with similar pieces. 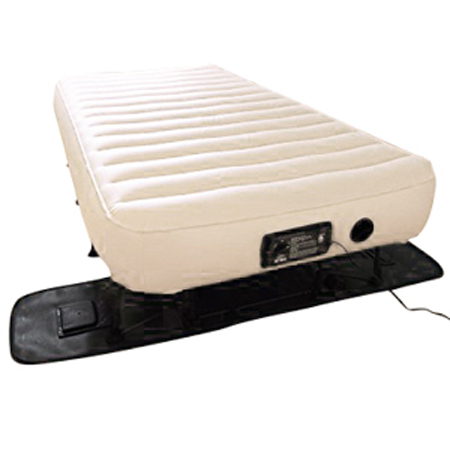 the inner construction is similar to that of the highly acclaimed Intex Durabeam airbed. Deflated size and weight – be aware that traveling with this Intex (especially by air) is not easy. We found that it never deflates fully and never packs as to its original packing size. It weighs around 15 lbs when deflated. Colors – one of the common question people had about this product and its Amazon listing is what does the part “Colors may vary” mean? It means just that – there is no way to specify a color, but this doesn’t mean that you can get any color under the sun. It’s our experience that the colors it comes in vary in the range of teal to navy blue and most commonly, black. Cup holder – this confusion dates back to a period when the fact sheet of the inflatable listed a cup holder by mistake. There are other similar Intex inflatable chairs with cup holders but NOT this one. The pump – pump is not included, we’d recommend getting an electric pump along with it. Any common pump usually used with an air mattress will do. When we started this category, it only included chairs, sofas and lounges. It was only last year that we concluded that it’s only natural that we include a section of the pumps we’d recommend getting along with the inflatable since most of them come without one. So, here we are, we’re going to look into a few air pump models (all of them electric and some of them rechargeable), the ones that stood the test of time. It’s very small (fits in my palm) and so fast, doesn’t even compare to the battery operated pump that I used before getting this one. It inflates a twin mattress literally in about 10 seconds. I love how small and easy to carry this electric air pump is. The hose is a nice touch, and it makes the pump much easier to use. It locks safely in place and works just as described. It’s shocking how fast and powerful this small thing is. It takes seconds to inflate a chair or a lilo. This is one loud motor! It’s lucky that it only takes seconds to inflate our pool ottomans. It’s a quick pump and the hose is a nice concept, but the hose on mine simply won’t stay attached, and I have to hold it in place while inflating our lounges. For most people and most inflatables, this pump will be all you’ll ever need. It’s small, yet it’s of high capacity and fast. So, unless you are organizing events and use dozens of inflatables chairs or something like that, this will do just fine. We haven’t seen any red lights that would question the quality of the Intex DC Quick-Fill (like complaints about the fit of the nozzles, motor quality and speed). The reviews that we got about this pump were overwhelmingly positive. It’s by far, the most practical solution (and value for money) among electric air pumps. Similar to the model we just talked about (in terms of capacity) this Intex comes with 12 V DC adapters for car or home charging and an adapter that allows you to use the pump while recharging. Powerful unit for a rechargeable air pump, the last one we had could only do so much…like 2 or 3 uses after recharging. We took this one to camping and inflated/deflated our 2 twin air mattresses 6 times each, no problems with the pump. It’s pretty quiet, almost silent especially having the power in mind. Holds charge great, very good value for money. Much better than a battery-operated pump. We used to have a Coleman that was run by 4D batteries and we could only use it 2-3 times before the batteries would run out. A rechargeable air pump is a much better option if you are into camping and hiking. I love the options…using it while plugged in, which gives you a lot more power, or recharging it. Just what I was looking for. Everything you might need. I was in a dilemma whether to get a standalone plug-in pump or a rechargeable and I got this one. It can be used plugged in, charged, and you can even use the car outlet to recharge it. Very pleased with the quality for the price. It holds a charge for weeks at a time with daily use. It’s small and compact, and you can use the car outlet. Perfect for inflating kayaks. Note that if you like your air mattresses extra firm, you’ll need a manual pump. The power this pump has when recharged can inflate the mattress well enough, but if you want it extra firm, you’ll have to use a manual or leg pump for that final 1 %. A battery indicator would be a useful addition while on the trail. It does hold charge well, but I’d like to know where I’m at and if I need to refill it. The three nozzles it comes with are not good enough for older pool toys with those smaller valves. Even the smallest nozzle is not small enough to get in all the way and push the rubber out of the way so that it can be inflated. If you need an all-in-one solution, this will probably be the way to go. It’s small and, for the power it provides, surprisingly silent. Opt in for a plug-in air pump (like the Intex DC we mentioned above) if your plan is to use it around the house or for pool lounges and toys. The rechargeable pumps will never be as fast as the standalone pumps. Having said that, if you need it for camping, hiking or any other outdoor activity, you’ll need a rechargeable pump like this one. It basically covers any scenario possible, and it’s the most versatile unit out there, especially in the price range. So, there we go, our choice of air pumps that will cover almost all scenarios. The first one a standalone plug-in powerful pump that will inflate anything you can think of in a matter of seconds. The second, a more versatile product that provides the flexibility of using it as a rechargeable pump, car-charged or home charged pump. Both are budget-friendly and reliable. Two products stand out in the category of the best pool out sofas and lounge beds – both by Intex. The first one if the Intex Pull-out sofa and the second one is one of our favorites – the daybed lounger. This inflatable sofa is basically the same product as the chair we mentioned earlier only bigger – it pulls out to a queen-size bed. The extra thick reinforced vinyl makes the sofa good choice both for indoor and outdoor use. Very practical item for camping. It’s a relief that I don’t have to inflate and deflate the beds every morning, I just fold it into a nice sofa to free up some space in the tent. Surprisingly silent. Surprising because it’s vinyl and it’s an inflatable. I’m not sure if it’s the finish, but there’s no squeaking noises. It’s a bargain – we’ve been using it for almost a year now. It is occasional use but still, amazing value for that price, we took it to Greece and used it in the water and we didn’t expect to bring it back. It held strong and didn’t give in at all, we now use for around the pool. I was hesitant to get this for my dorm because I know what kind of “abuse” it would have to take. I finally decided to go with it and it didn’t disappoint, holds air for days at a time. We initially got this when we moved to our new unfurnished apartment and ended up using the sofa for months after we got furniture. We now use it for camping and travel, very good value for money. I didn’t expect this to looks so much like a real sofa. It’s very well made and sturdy and holds without adding air for weeks at a time. I love how soft the finish is, feels like velvet. It does look like a sofa but the side arms are not really solid enough for heavier people to lean on. The smell of the plastic can linger on for days. It does go away, especially if you leave it out for a day or in a well-ventilated room…just something to be aware of. If an inflatable sofa is what you need, then you don’t really have many options and, speaking frankly, this one is by far the best choice (especially in the category of value for money). It is better than expected if you are judging just by looking at the pictures and reading online reviews. It’s bigger and much more like a regular sofa than you would expect from an inflatable. We’ve seen reviews of people mentioning air leaks and the sofa losing shape. It’s our honest opinion that the issue is not (most of the time) with the sofa itself but with new owners not following the instruction manual. Indeed, with many products that are intuitive, you can toss the instruction manual aside and just start using the product. But an inflatable sofa is not a blender and the following the instructions are a crucial in getting the best out of your new inflatable. The one part that people often miss is the part that explains the stretching of the vinyl, so if you do get this sofa, please make a special not of this – FOLLOW THE INSTRUCTIONS TO THE LETTER WHEN YOU FIRST INFLATE THE PRODUCT. When you inflate it, the vinyl starts the stretching into its natural shape. If you want to try it right away, the air inside isn’t distributed normally and you might end causing micro-tears in the seams that will go on to become air leaks. While the vinyl is not fully stretched, you can cause the chambers to be “set in” certain shapes or pop internal seams – this might result in the sofa loosing shape in time. We made it sound more complicated here but it’s just to make a point. In fact, it’s really simple – just follow the instructions. Inflate the sofa, leave it be for the time recommended in the instruction manual and then add air to your preferred firmness. When used right this sofa is likely to one of the best purchases you ever made. This beauty deserves its pompous name. It’s one of the all-time favorites around the office here at 3Beds.com. Nevertheless, our ratings are based on what our featured testers share with us, so the high ratings (can only be compared to the SoundAsleep Dream Series air mattress) are not a result of a bias. The picture doesn’t really show how attractive this bed is. Live, it looks regal. We barely praise design like this because we’re more about the technical side of things like quality and air retention but this daybed is an eye-candy. It’s very versatile and can be used for anything from sleepovers to beach fun. It sets up and down in minutes, much faster and easier than you’d expect from an inflatable lounge bed of this size. Depending on what you’re doing this comfortably fits 2-4 people. But for 2 people to lounge around the pool is just perfection. It’s comfortable to the point that you forget it’s an inflatable and hold air forever – I forgot the last time we topped it off. You don’t expect to own (and use regularly) something like this, an inflatable, for years with no problems but this is just what’s happening with this daybed. It’s been the centerpiece of every yard party or sleepover we’ve had for the last 2 years. I can’t believe the quality for the price of this thing. A few vacations, countless sleepovers and kids jumping on it with grass underneath and no punctures or leaks. The bottom really is extra-strong as advertised. If this thing popped today, we’d get another tomorrow. The use we got out of it. We’ve already used it on about a dozen camping trips and it looks as good as the day it arrived. Imagine 8 people lounging on it on a starry camping night and gazing at the meteor shower. That’s exactly what happened on our last camping trip. Both mine and my brother’s family gathered on this thing and enjoyed the view. This is a new must-have for us. Paired with a few chairs, this is all the patio furniture we now have. I’m so glad we sent with the inflatables, it’s just much easier to handle, cheaper and more fun. I expected the backrest to be better and more firmly attached. We do have a few devilish toddlers jumping and playing on it but I didn’t expect the backrest to become loose every few days. I don’t understand why there are no color choices. We already have one and it would be great for pool parties to have, say, three in different bright colors. It looked great when we got it and we were all very excited about using it on our camping trip, especially the kids. That didn’t last long because it started losing air after our second trip and the most frustrating part was that we couldn’t find the leak. The PVC used for the bottom of this inflatable is as thick and as durable as they come. It’s similar to that of the classic Fox airbed (even thicker) and this bed can take more abuse than 99% of inflatable out there. We love the modern design and, statistically speaking, we didn’t find flaws with air retention and leaks. It means that this is a solid product and if you happen to be one of the few people who get a dud (one that develops an air leak) you can easily replace it or get a refund. As with all the inflatables, it is crucial to follow the instructions and let the PVC stretch for a few hours and then top it off. Also, the fact that the bottom PVC is “extra-strong” doesn’t mean it can’t be punctured by thorns or sharp objects. Last but not least, you’ll be the talk of the town having something like this at your pool party. Let us say it again, the images you see don’t do this daybed justice. It’s much more impressive in person. OK, so, we’ve covered our top pick in the categories of inflatable chairs for adults, best air pumps to go with those and inflatable sofa beds. This last section wasn’t initially part of this guide and we’re new to this so the pool of data and reviews we have is yet limited. This is just the 4th update of this section. However, in the relatively short 8 months that we’ve been looking into inflatable pool lounge chairs and ottomans, 4 products have stood out as by far the best-rated. Again, two of these come from Intex, one is a high-end pool lounger from Poolmaster floats and one classic from Go Floats – the Lazy Buoy. Poolmaster has been in the pool floats and accessories business since 1958 and the Rio Sun is one of the jewels. But it comes, with a hefty price tag. The Poolmaster Rio Sun is hands down the superior product and it’s in a category of its own with features that are nothing like those you’ll see in the other pool floats. You can use it to lounge in any position, from a full upright to fully reclined. And it’s no complicated to use, you just adjust your body position and the float adjusts. It’s not actually an inflatable since it’s the big arm rests allow it to float. It’s luxury embodied and will be the choice of people who want to pamper themselves. I’ve been getting my pool stuff from Poolmaster for years now and most of the experiences have been positive but this one tops them all. Amazingly comfortable and easy to use. Very richly padded and cannot be compared to any other pool floating recliner – it feels just a regular home recliner. I love the colors and the design and above all, how comfy this baby is. It might be a bit steep but to me, it’s worth every penny. My wife and I decided to spend some extra money on this chair instead of constantly struggling with inflatable floaties throughout the summer. We didn’t regret it, it’s a huge relief. Well worth the extra money. A high-end item like this should come with a detailed instruction. Otherwise, the main thing, which is the adjustable reclining angle, becomes a frustrating task. You have to know what you’re doing – you push down with your legs to adjust it or use the indentation on the floats. I wish it had a cover that comes off so that I can wash it. It’s been three months and the once beautiful vivid colors are starting to fade under the stains. We have two toddlers and there’s a lot of juice and jello action going around the pool. I think our next chair will be a simpler inflatable recliner. As we said, the Poolmaster Rio Sun float is basically a lounge chair that you can use in water. The feeling is not that of on inflatable but of an actual lounge chair. Bottom line – if you enjoy luxury, you’ll love this one. One final word of advice – you might see this recliner in a range of prices on Amazon. It’s the same product by different suppliers or re-sellers that charge 3-5 times as much. The link we are providing is the link to the original product with the original price. Don’t make the mistake of comparing this to the cheap floats for kids. This is one sturdy and comfortable floats. It easily supports my weight (250 lbs) and it’s spacious enough for it to feel like a real lounge chair. We’ve been buying floats and lounge chairs for our pool for over a decade now, and this is by far the best one we ever got. Just right in every way, the price is a steal, the plastic feels high quality and it’s well-balanced…no way to tip over. This is bigger than I thought, at 5’2 I don’t even have to touch the water if I don’t want to. They got the reclining angle just right, perfect for chilling on the pool or reading a Kindle book. I got this for a float trip after seeing it at a friend’s house. I wasn’t sure about using it for the float trip but it was perfect, easy to paddle and maneuver. The cheapest product in this quality range by far. This float recliner is well-worth it, I’ve been using pool recliners and getting new ones every year. This is thee first one that’s so well-made and kept shape and size for 3 years. Most of the pool floaties we got over the years would start to leak air after a few weeks. This is the first ever to actually hold its own “against” an army of teen boys through the summer. We got a defective one, it just wouldn’t stay inflated. So, now we are going through the hassle of returning it to get a new one. Why they’d make a solid product and put in cheap cup-holders that deformed under the sun after a few months of use is beyond me. It’s not easy to get on or off if you are not agile. I did figure it out, I place it by the side of the pool and just slide onto it. It’s just something to keep in mind. The one-month return warranty is too short. I ordered mine before the summer and left it to just sit in the garage for a month and a half. When we finally tried to use it, it wouldn’t hold air for longer than a day and since I was past the return deadline, it was just a waste of money. This is the pool lounger that (along with the Lazy Buoy that we’ll talk about in a minute will be the choice of most people looking a pool floaty). It strikes the right balance between cost and quality and is one of the few pool loungers out that’s actually built to last at a price that’s only a fraction of the Poolmaster we mentioned above. Apart from that, most people look for something that will withstand abuse of kids and pool parties and this Intex is just the thing. It’s no surprise that the product has been in the TOP 3 of this category since we started it. It’s as simple as this – if you ever have people over or have pool parties, the Lazy Buoy is the must-have among pool lounges. The ONLY pool float made of raft-grade PVC! As opposed to most pool floaties that are designed as just that (pool lounges), the design of the Lazy Buoy is inspired by the similarly named oversized home chair – the LazyBoy. What are the users saying about the chair? We’ve had a pool for about a decade now and we buy floats practically every year. This one is by far I have every owned. It’s simple and fast to inflate. We got two and just ordered a third one because, when we have people over, who gets to sit on it becomes an issue. Worth the few extra bucks. This inflatable changed the way I perceive pool floats. I used to get them for the season and then discard them because they would either puncture or loose shape. This is the third year we are using the Buoy and, apart from the colors not being as vivid as they used to, it feels like it did the day it arrived. Very sturdy for an inflatable, we just got it and we are yet to test it but, out of the box, it feels much superior to the Intex floaties we had so far. For a big guy like me (I’m about 20 stone) it’s crucial that the pool float is stable and does not flip over. This is exactly what I was looking for. I punctured mine on a sharp edge of my grill. The patch that comes with this product is a real patch kit. I’m saying this because the “kits” we used to get with similar products were unusable. We use it both in the house and the pool. Our daughter loves it so much it’s in her room for the winters. So, needless to say, it takes a lot of “abuse”, jumping and playing on it and it still didn’t give in after a year and a half. This might be good for parties or sitting around but this can’t be used for tanning. It’s just the angle, I use one of old cheap floaties for that and sit in this to read or have drink with a friend in the pool. The part of the rating process that includes our own ratings (majority of it is based on user and featured tester reviews) had this float rated even higher. It’s refreshing to see a product so well-made and with such attention to detail. Starting from the quality of the PVC (we already mentioned a few times it’s the only raft-grade) to the patch kit. In most of our guides we recommend getting a kit from a Walmart or something, but not this time. The patch kit that comes with the Lazy Buoy included somewhat softer PVC (this is how it’s supposed to be so that it can “hug” the curvature) and the adhesive is industrial grade. In this case, things like that are more of a statement on the kind of operation they run at GoFloat. It is our opinion that there is no other pool float on the market that is less likely to puncture, loose air or give in at the seams than the Lazy Buoy. We hope that they soon come to the market with a few color choices. If you ask us, a full five-star product. For this section of the guide, we ordered and tested about a dozen of patch kits and, here, we present two winners. The whole purpose of reviewing and analyzing quality of the inflatable products is to pinpoint the one that are least likely to give you any trouble, like air leaks or punctures.But, again, these are inflatables and even the best of them can cause puncture. This is when you need to know what PVC patch kit is the best and will do the trick. First of all – the patch kits that come with the products are inferior and we keep stressing that across the site. Second – if you are getting a patch kit, you’ll need to know exactly what to get. That’s where we come in. When we first tested the various tapes and glues, we expected a regular PVC glue to come on top. We figured that a tape simply can’t be strong enough to fix a hole, let alone hold a seam or a tear together. Boy were we wrong – the Tear-aid patch tests are only close to the runner-up (Coghlan’s Airstop). All others adhesives were nowhere close in durability. We sent out 10 packs of the tear-aid and we made sure that our testers test it on different products and brands and the results were nothing short of shocking. The initial testing was conducted about two years ago and the top-rated product has been reigning this category ever since. If you are looking for a permanent solution, the all US-made Tear-Aid is your best bet. If this is not your first time looking for the best way to fix an air mattress you know the main issue is the very nature of vinyl. It’s surface contains oils (it’s what gives it that slippery feeling) and these oils make it much more difficult for anything to stick to the PVC. With most adhesives, the chemicals in the glue and the oils of the PVC bond and create a thin gooey mixture. It’s why, in-time, the bond loosens and starts letting air through air or curls at the ends before eventually coming off. What Tear-aid (tape type B for vinyl) did is eliminate that problem by adding a chemical inhibitor that prevent the glue from reacting with the vinyl oils. That’s why the repaired tears or holes become just as strong as the rest of the material. Definitely worth the few extra bucks – we needed it for the pool lounger that we paid a lot for so we decided to go with quality adhesive trying to repair it. That was last year and the hole we fixed is holding as strong as the first day. We have an EZ mattress that we just refused to throw away and tried several adhesives before getting this tapes. Nothing worked for long until this. The product is not like other vinyl tapes out there, we can share that first-hand. It stick so well it’s barely noticeable, feels flexible and there’s no curling on the edges of the tape. We got this the same time we got our lilos and pool recliners and we used it on two of them that developed pinholes. It’s much better than using glue, it doesn’t get gummy in the heat and nothing changes when it gets wet. If you are need it for your pool stuff, nothing comes close to it and we’ve tried all the best stuff out there. Very easy to use, just cut and apply. Not as close as much cleaning and preparation as it takes with a regular repair kit and it holds just fine. My husband sleeps on an air mattress because of his back pain. A few months back it started deflating overnight and his back problems got even worse. We tried two patch kits before getting the Tear-Aid. The other two would last about a week or two before the airbed would start using air again. We got this and it’s fair to say that this product does wonders – it’s been a month and the bed is as good as new. This tape is so strong that I repaired a 10.000 gallon above-ground pool. So easy to use and apply and it held perfectly the whole season. The air mattress that I have is far too expensive to just give up on so I did a lot of research on the best way to fix an air leak and this is the product I landed on. I couldn’t be happier with the purchase, I know that fixing this kind of thing doesn’t usually last but this looks and feels like it’s taken to the mattress seam very well and I see no air loss…so far so good. I found it tedious to use. If you are not careful, it gets stuck to itself and becomes unusable. You’ll have to be extra careful when peeling it off the surface it comes on, it’s very thin. A word of advice – when you are cutting the tape make sure to cut the corners into a curve. I’m not sure if it’s just me but the first time I tried to repair the Intex chair the rectangular parts of the tape started curling up after a week or so. I removed that, cleaned and dried it again and cut the tape differently (rounded the corners) and it worked just fine. Didn’t work for me – the outer seam on my blow-up bed popped and I tried to fix it with Tear-Aid – didn’t work. I think the fold of extra vinyl on the outer seams might be the reason, you can’t get a good enough grip between the materials. There are repair kits and then there’s TEAR-AID type B. It’s not often that we praise a product as directly as with this tape but there’s simply no other product on the market that comes close to the versatility, ease of use and durability of the Tear-Aid. For our purpose (a patch kit for inflatables like pool lounger or airbeds) we’ll be needing the type B, type A works better with fabric. It is important to closely follow the instructions that it comes with this tape, that’s not a hard thing to do. Find the hole (you can see our guide on that here), clean the area, dry if necessary and apply the tape. Done properly it will result in a long term solution for your problem. We’ve received a few questions along the lines of “Where can I buy tear-aid”. Not all stores carry it and they might recommend something else that is “just as good”. Don’t go for it, no repair tape out there is as good. The easiest way to get Tear-Aid is order online in reliable stores like Amazon. Air mattress deflating and no hole? Scenario one (and the most likely scenario is simple) – THERE IS A HOLE YOU JUST CAN’T FIND IT. The fact that your airbed is deflating and there’s no hole or leak you can see or hear, usually means that there’s a pinhole somewhere so small you can’t find it. Here is a detailed guide on what to do find those small elusive holes. Scenario two – your airbed might be leaking in the area around the pump. To check for this, dilute a bit of dish soap in some water and spray it around the area. If this is what’s happening, you’ll see bubbles. Alternatively, if you don’t want to get your mattress wet, take a freezer bag and tape it around the valve with the air squeezed out of the bag. If the valve is leaking, you’ll soon see the bag filling up with air. Now that we have that covered let’s move on to the runner-up in the category of patch kits. The Coghlan’s Airstop is a special product because it can work without a patch, you just apply a few coats of the stuff and it practically turns plastic and becomes a part of the thing you’re fixing. You can see a pattern here – the two best patch kits are not what you’d call a classic patch kit (as in glue plus a patch) but a seamless tape and a patch-less adhesive. The downside is that you can’t really use the adhesive on large tears and for seams, but it is such an elegant solution for most air leaks, smaller tears and especially pinholes. The Coghlan’s also covers a range of products: blow-up beds, groundsheets, pools, inflatable toys and boats. I use this for my waterbed and it works like a charm. The bed was expensive and I am not ready to give it up yet, but it develops a hole every few months, which means that I’m using the Coghlan’s through the year and it works better than I expected. This was my third attempt to repair my favorite Aerobed. I use two different adhesives before trying Coghlan’s Airstop and I finally found a permanent solution. It’s been 4 months and it holds like cement. Amazing fix for just a few bucks. I was already getting ready to get rid of some of my pool accessories when a friend recommended this. It works as advertised, it’s especially good if you need it for a pool inflatable. The patch on our Intex Lounger held for the whole season. I didn’t expect this to work to be honest because we’ve already tried fixing our inflatable motorboat with much more expensive adhesives and even tire glues. Most of them would hold for a week or two before the boat starts to deflate again. We got this stuff without getting our hopes up but worked amazing. We deflated the boat a bit and applied 4 coats of Coghlan’s within half an hour and it seems to have done the trick. They are under-selling this stuff, when I was looking into getting a patch to fix my Intex chair I looked at this product and didn’t see any claims from the company about how well it works. I got it based on the reviews I’ve seen and it is powerful stuff. It’s very easy to use. We go through about 4 bottles a season of this stuff at our small beach-side hotel. We had problems getting this shipped to Europe (we’re in Lefkada, Greece), so we have an American family that stays with us every year bring a few bottles every year. It works great on everything from pool rings and floats to beach volleyballs. This worked on a tear about 1/3 inches long. I wasn’t even aware that there is a patchless fix for an air mattress, but this worked amazingly for our queen airbed. It was difficult to use and follow the instructions because the glue dries up instantaneously. There’s no time to line things up properly if the tear or hole is large and you need a piece of vinyl to cover it. I don’t understand why they changed the packaging. I was using this stuff for the pool floats for years and it used to come in a nice jar with an applicator. This new tube clogs up after 2 uses like a tube of crazy glue. Didn’t work for our outdoor pool. It might work for other inflatables and smaller tears but if it’s anything serious that requires brute force do yourself a favor and get a patch. With Coghlan’s Airstop it is crucial that you follow the instructions to the T, especially if you are using it as patchless option. The adhesive can be used even on the flocked surfaces of inflatables and it’s usually taking to the flocking quite well which makes it a great option for indoor air mattresses. Used correctly, Coghlan’s Airstop is powerful adhesive and is superior to similar products out there. In our opinion, it’s the only patchless solution worth mentioning. We’ve covered a lot in this guide, from top choices among inflatable chairs and sofas, through pool loungers and floats to the best air pumps and patch kits. To be relevant and up-to-date we do updates of the guides once every two months or once every 4 months (up to once a year), depending on the type of the products. It’s 4 months with some of the most expensive airbeds, and it’s once a year for pool loungers because that’s the only way we can make the sample big enough for the ratings to be reliable. There is a lot more going on behind the scenes but what you see is very simple, we make sure of that. In the end all the work that goes into the reviews is boiled down to a single number – it’s rating. All with the purpose of making things simple for you.